The National Wild Turkey Federation recently honored the distinguished career of S.C. Department of Natural Resources' Director Alvin Taylor by presenting him with the Lynn Boykin Hunting Heritage Award. The award was presented Feb. 13 to Taylor at the National Wild Turkey Federation's 40th annual Convention and Sport Show held in Nashville, Tenn.
"Being recognized by an organization like the National Wild Turkey Federation is a tremendous honor, not just for me, but for everyone at the DNR," Taylor said. "It's another example of the long-term commitment this agency has with the National Wild Turkey Federation for the wild turkey and hunting and quality habitat for countless species." The Lynn Boykin Hunting Heritage Award's namesake was a former president and chairperson of the National Wild Turkey Federation's national board. During her tenure, she emphasized the importance of our hunting heritage and helped create a new outlook for the organization. Today, the National Wild Turkey Federation's mission to celebrate and preserve North America's hunting heritage is some of its most important work. 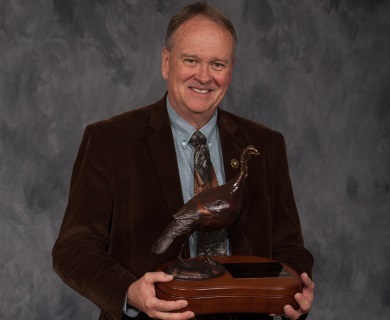 The National Wild Turkey Federation determined this year's award winners based on how their work strengthens the organization's Save the Habitat. Save the Hunt. initiative. Taylor and the S.C. Department of Natural Resources (DNR) were early supporters and financial contributors to the Palmetto Shooting Complex at the National Wild Turkey Federation headquarters in Edgefield, because Taylor understands that the recruitment of hunters is vitally important to wildlife conservation. The $2 million Pittman-Robertson Wildlife Restoration grant from DNR made it possible for the facility to open in October 2015. "Alvin truly deserves the Lynn Boykin Hunting Heritage Award," said George Thornton, chief executive officer of the National Wild Turkey Federation. "He and the DNR share our mission of preserving our hunting heritage and ensuring conservation efforts are based on sound science. I am proud to call him a friend and a strong supporter of the National Wild Turkey Federation." For more information about the National Wild Turkey Federation, visit http://www.nwtf.org.